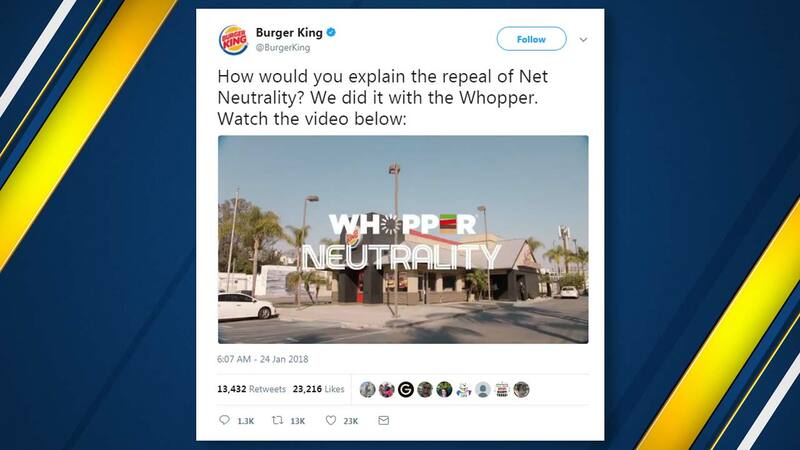 Burger King is delivering its own hot take on a regulatory showdown that has enflamed the U.S., using a flame-grilled Whopper. NEW YORK -- Burger King is delivering its own hot take on a regulatory showdown that has enflamed the U.S., using a flame-grilled Whopper. Burger King's new ad has become a sensation, with more than a million views on YouTube and it's lighting up Twitter. There's even a jab at Ajit Pai, who heads the federal commission that voted late last year to eliminate net-neutrality protections for the internet (hint: look for the colossal Reese's coffee mug).